The human race being the only one of all relations that's lost the inner knowing of its purpose. We got So imbedded in the EXPERIENCE of the dominant species that we FORGOT our true purpose. Anyone reading this now knows this either consciously or subconsciously. THE VALUE OF ART is profound. It began on the cave walls. Where is the truth in popular culture? Does material value organize society? ART must stay human. ART is a reflection of cooperation, in the cave walls where cooperation was reflected upon in order to evolve is the evidence and it left no-one behind, which brings me to my present project called “STATUSFERE” Everything depends on the other, so do we wan to be creative or dominant? From cell to cell, from atom to universal fusion, Art begins when we meet, a cross pollination. We have been looking away from each other for some time now and it has created a permanent kink in our linking radius. I know we can ENCOUNTER ourselves anew by dropping the dream riddled with egoistic growth, the high speed world of abstraction which creates environmental devastation, the ethical bankruptcy and cultural confusion which leaves us empty and lost. Instead allowing the agonizing imperative to create from our most honorable hearts a journey to develop a domain of Global Responsibility. Inspiration expands from COOPERATION, this way we can celebrate more than we mourn. We must now take our direction from nature and do like the bees, the fish and cooperate for the whole. My team is here to forge a unity with universal values and keep genuine meeting as the initial spark to creative endeavors that serve the whole. We have been given the raw materials to recreate reality, to embellish the possibilities. The RAW MATERIALS are Earth, Air, Water, and Fire, these are the ingredients of human nature. Particle collision is instinctual cooperation. But special note must be given to Laura Sottile, who gives an absolutely marvelous performance as Ofelia, the matriarch of the family. There is never a moment when you see her working at her craft: physically and vocally she is as balanced and slow-burning as a Montecristo No. 2…and when passion is required, she deals it out such that no one can refuse her! 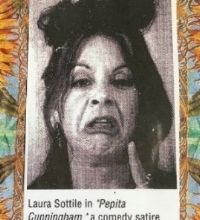 Laura Sottile is once again possessed by the outlandish character of Pepita Cunningham. A must see!